Press the included magnet against the sideof the bottle and watch as the ferrofluid moves towards it and then spikes, showing the magnetic field your magnet is generating. Ferrofluid is an amazing fluid that magnetizes when exposed to a magnetic field. 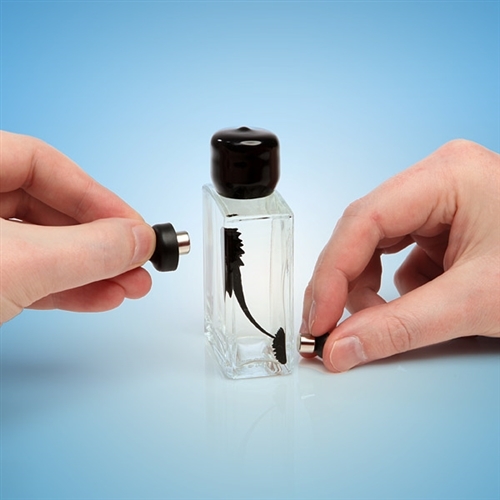 Because it is made up of tiny, tiny particles suspended in a clear liquid the ferrofluid normall forms a pool, but near a magnet it spikes out. Using this bottle, you can examine and safely play with ferrfofluid without mess or danger. For ages 17+, this is not a toy. Inlcudes sealed 50ml glas bottle (9cm tall) 1 ml of ferrofuid, and two magnets with handles.